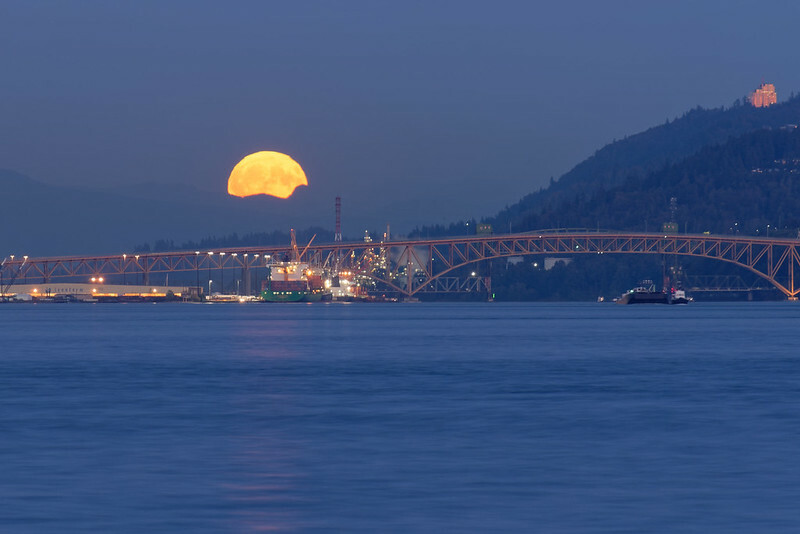 Watching the Harvest Moon rise over Burrard Inlet. 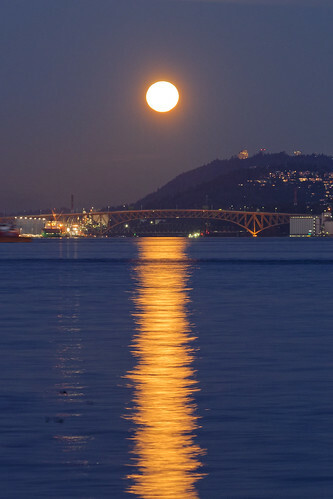 A clear evening for a full-moonrise is not that common in Vancouver so I jumped at the chance to scope out a good place to set up my camera for this one. 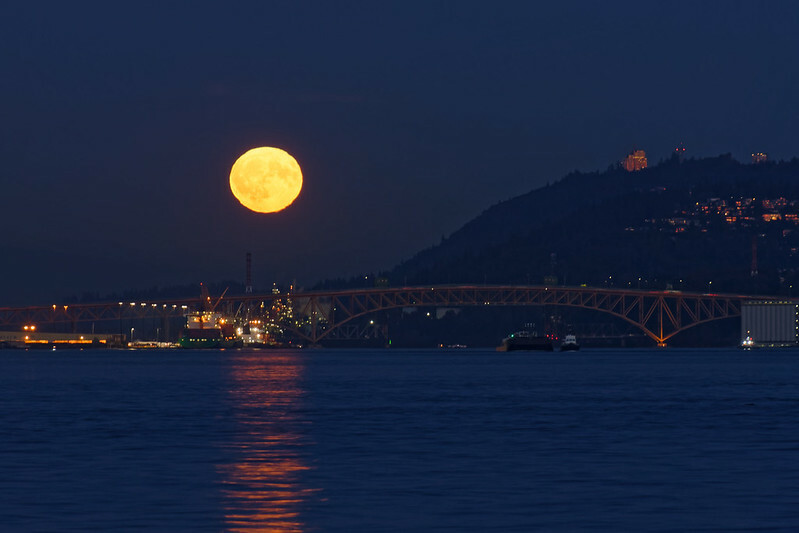 Using the Photographer’s Ephemeris I decided on the Stanley Park seawall with a clear view towards the Second Narrows bridge to the east and, with moonrise at around 7:25 pm, I knew I had just enough time to get home from work and get down to the park. I hoofed it down from the parking lot by the aquarium onto the seawall and walked along to my designated spot, pulling out the tripod on the way and extending the legs just as I reached a convenient bench. This moonrise wasn’t quite as good as the one back in January last year, because the moon rose after the sun had set. This meant that the sky was much darker as the moon brightened, making it much harder to balance the exposure. In the end I mostly exposed for the moon itself, but the reflection on the water was too good to resist. 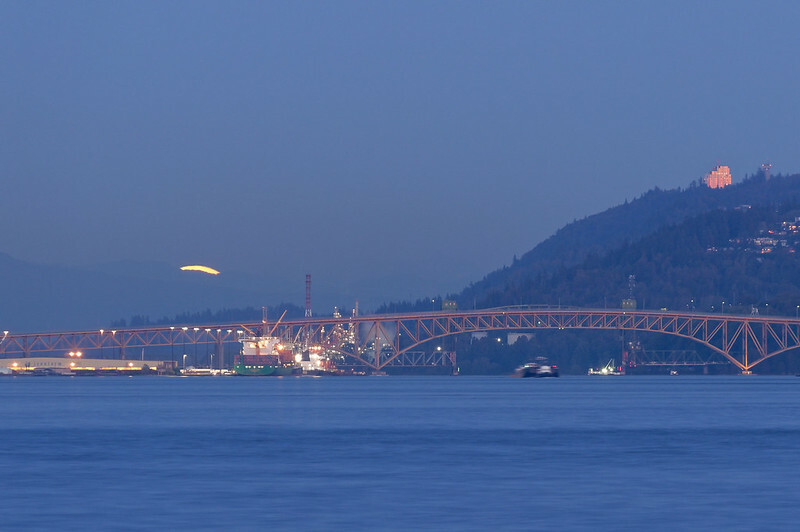 I also didn’t have such an impressive backdrop, and I think I might have been better off trying to get the moon to rise directly over the steel girders of the bridge, although I didn’t want the moon to disappear behind Burnaby Mountain too soon. Still, I’m pretty happy with the results. The photos on Instagram were from a quick processing session immediately afterwards. I took my time a couple of days later and processed the photos slightly differently to put on Flickr, with different lighting adjustments, noise reduction, crops, and a half-baked attempt to remove some of the red fringing around the bottom half of the moon caused by the lens being slightly out of focus. See for yourself.